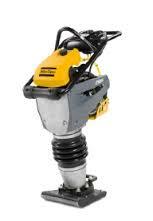 Atlas Copco LT800 13 inch Jumping Jack/Rammer available for rent in Rochester NY, Ithaca NY and Upstate NY from the Duke Company. Atlas Copco wants to help boost your workflow in several ways. The automatic air breather system makes start-ups more convenient. Fixed throttle positions facilitate handling and reduce wear. To help you get closer to walls, posts or wherever work is taking you, we have made our rammers slimmer. Quality components and renowned engines give you uptime.